Unsightly belly fat can get in the way of one’s appearance. It can also be a risk factor for a number of diseases. Trying to banish belly fat can be quite a challenge for many people. In order to get rid of it, you need to understand more aboutfat in general. It is important to know that fat is not entirely bad. It serves a purpose as the body’s energy storage facility. It also helps to provide some level of protection on certain parts of the body, working as an ideal cushion. The body stores fat in two ways- as subcutaneous fat and visceral fat. The former is the type of fat found just under the skin. The latter is fat stored deeper inside and around the vital organs. 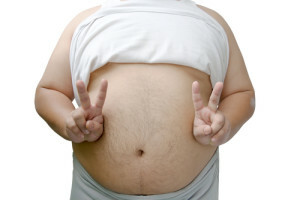 While visceral fat may cushion the organs, it may also be a health risk if the body stores too much of it. This is the type of fat that can pose a danger to one’s health. If you wish to get rid of excess fat, you need to address them through these key areas. Following the proper diet can help you avoid packing up the pounds in terms of belly fat. You always need to monitor what you eat in order to get rid of belly fat and keep it away. One thing that you should always look out for is your sugar consumption. Many of the processed foods that you can find in the supermarket today contain sugar in various amounts. There are also hidden sugar found in supposedly nutritious food products such as cereals, whole wheat bread and orange juice. Try to keep close track of what you eat, especially the amount of sugar that you consume daily. Aside from that, you also need to keep track of the carbohydrates and fats that you consume. You should try to consume more complex carbohydrates and do away with those simple carbohydrates found in most processed foods. You should also be aware that there are good and bad fats. Consuming only good fats can even help you burn fat away. Again, you need to avoid processed food products to stay away from the bad fats. Try eating more natural and unprocessed food and keep your calorie consumption in check to get rid of belly fat. Physical activity can help you banish those fats away if you partner it with the right diet plan. Aerobic activity such as walking and jogging can help you stay slim. You should get at least two and a half hours of moderate aerobic activity per week in order to burn those fats away. A combination of aerobic activity and strength training can help you get rid of belly fat. Adequate sleep is also important if you wish to banish belly fat. Too little or too much sleep has been known in studies to affect the way the body stores abdominal or visceral fat. In studies, people who sleep five hours or less and those who sleep eight hours or more every night also gained more visceral fat than people who slept from between six to seven hours on average per night.